Oloya is in pain. Ronnie Layoo. OYAM—Ambrose Oloya is in pain. Pain from the tumour that has bloated his cheeks pain at fate denying him even a smile in his puberty—a time when teens are most sensitive to their bodies. And his pain is shared with his entire family. It all started with flu that hit the household in August 2013. 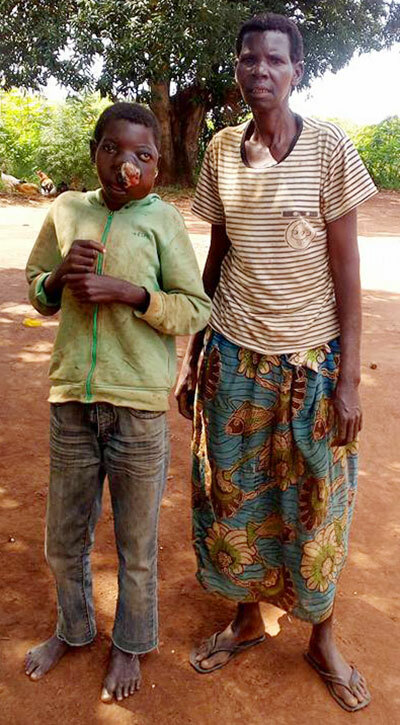 Oloya was 12 and as the other family members overcame the flu, Lilly Okot realised her son was still down with it. He was struggling to breathe. Over the last four years, the family has run in desperation from one hospital to another, from one corner of property to another—to sell to raise medical bills for their son—and from hope to disillusionment and back to clutching at the last straw of hope: that some well-wishers could step in to rescue their son Ambrose Oloya. “When the flu could not subside, we first took Oloya to Ngai Health Centre III in Oyam District. He was treated for common colds and malaria. But this did not help,” says Okot. 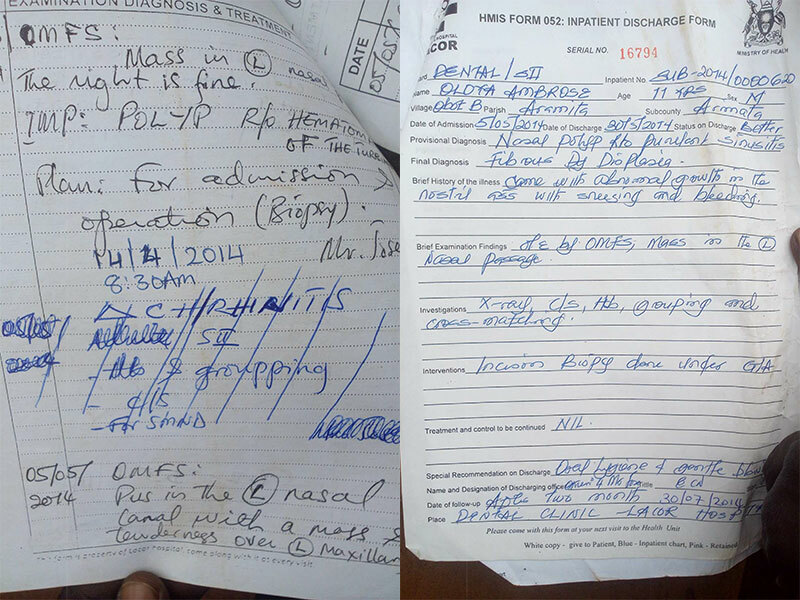 Subsequent visit to the hospital and medical reports seen by PML Daily shows that this time round Oloya was treated for nasal polyps. According to Mayo Clinic, nasal polyps are soft, painless, noncancerous growths on the lining of your nasal passages or sinusitis. They result from chronic inflammation due to asthma, recurring infection, allergies, drug sensitivity or certain immune disorders. But Olaya’s situation did not abate. By March of the following year when they returned to the hospital, he reported difficulty breathing with the nose and that he had only been breathing through his mouth over the last five months. He also reported headache and pain around the eyes. According to the medical report, the doctor noted that the patient had thick nasal discharge, translucent swelling in the nostril and was breathing with the mouth. The medical conclusion was that he suffered from sinuses and ethmoidal polyps, which are multiple, bilateral, painless, pearly white, grape like masses arising from the ethmoidal air cells—cells present on medial to the eyes. Ideally, polyps are red flags indicating the presence of chronic inflammatory such as chronic sinusitis or allergy, according to medics. “When the ailment continued to worsen, the parents decided to seek the opinion of other doctors. This time it was Opit Health Centre III, a branch of St Mary’s Hospital Lacor in Omoro District,” Okot says. 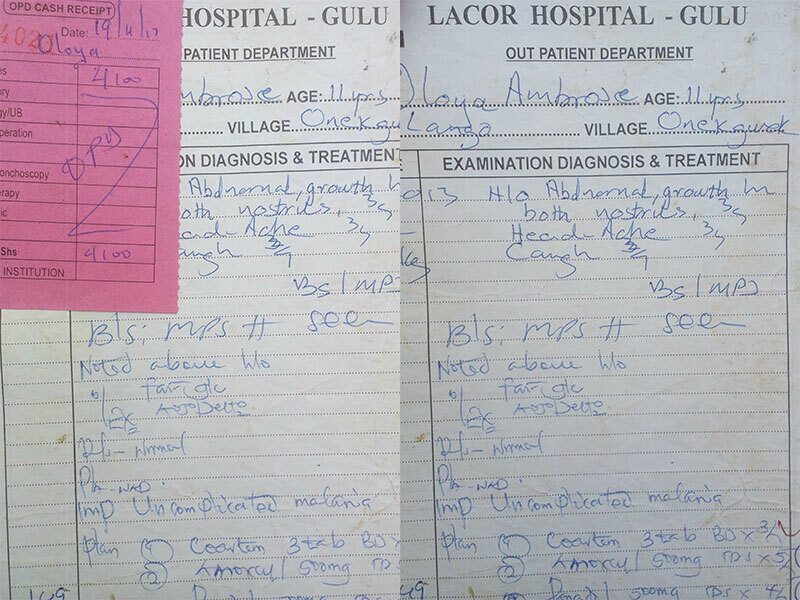 The clinic referred the patient to the main hospital in Gulu District. At Lacor, several diagnosis were done. Nasal polyps was one, but the diagnostic conclusion showed that Oloya was suffering from fibrous dysplasia. The patient was referred for further tests with scans confirming the damages the disorder had already caused to the teenage boy. According to Mayo Clinic, fibrous dysplasia is an uncommon bone disorder in which scar-like (fibrous) tissue develops in place of normal bone. This irregular tissue can weaken the affected bone and cause it to deform or fracture. Doctors recommended an operation of the nose, but no immediate action was taken. The parents could not afford the fees. 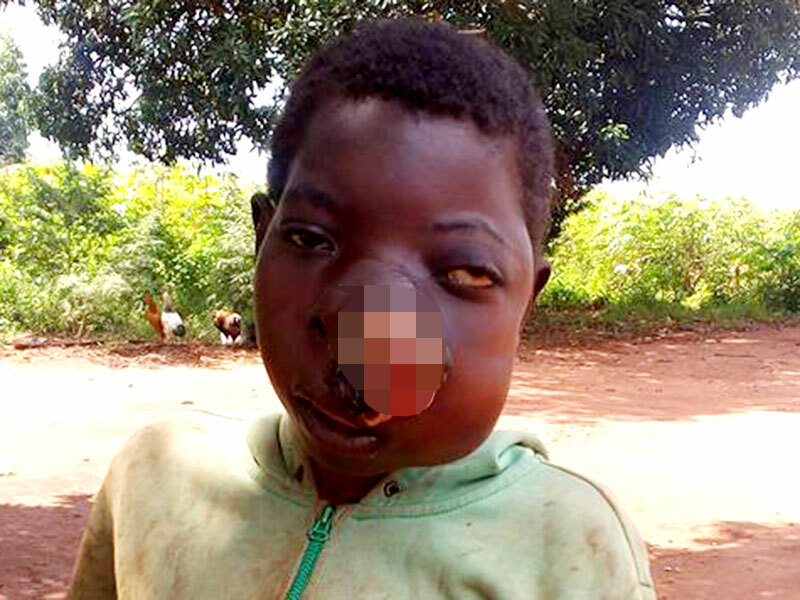 The patient was discharged but swelling and severe pain continued, which forced the parents to again try private clinic run by Dr David Olila in Lira District. Oloya had an operation on his nose. But there was bad news; it wasn’t successful as the swelling even worsened. This time the discharge from the nose revealed rot. Dr Olila couldn’t help any further and advised that the parents take boy to Mulago Hospital. With no more money left having sold almost all family property to raise Oloya’s medical fees, the parents retired with their son to the home in Obot B Village, Aramita Parish, in Oyam, feeling hapless and wretched beyond misery. But one last idea has kicked in: that of reaching out to well-wishers for help to save their son. When PML Daily visited the family, Oloya could barely speak. He was in pain, he said. Dr Louis Okema, a specialist in Ear Nose and Throat (ENT) and lecturer at Gulu University Faculty of Medicine, said abnormal growth in the nose is fairly common and they are of several kinds; some are cancerous. The abnormal growth presents nasal discharge, blockage, bleeding, blood, pain and headache and sometimes also involves the eyes, like in the case of Oloya, he said, requires that further examination to ascertain whether the growth is cancerous or not by removing samples for testing and further analysis of biopsy to determine whether its cancer. Treatment should involve provision of pain killer to control excessive pain and sometimes surgery and radiotherapy will have to apply. 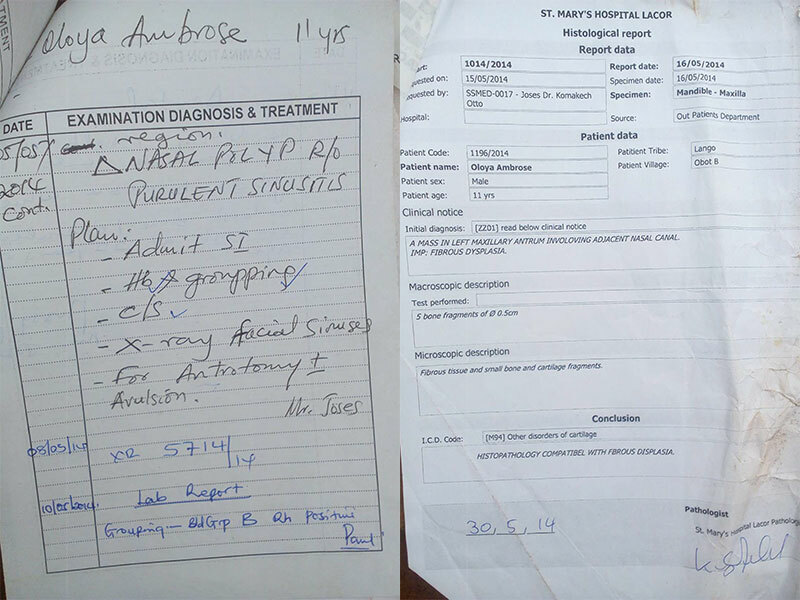 Biopsy testing at some laboratories go for between Sh80,000 to Sh90,000. To the family that is already feeling down, such figures are hard to raise. But even if they did, they will probably need no less than Sh2.5 million for surgery. The family is seeking financial support to enable Ambrose Oloya get medical assistance. Based on medical conclusion from diagnosis that showed that Oloya is suffering from fibrous dysplasia, here is what you need to know about the medical condition. Although fibrous dysplasia is a genetic disorder, it is caused by a gene mutation that is not passed from parent to child. There’s no cure for the disorder. Treatment, which may include surgery, focuses on relieving pain and repairing or stabilising bones. Fibrous dysplasia may cause few or no signs and symptoms, particularly if the condition is mild. More severe fibrous dysplasia may cause bone pain, usually a mild to moderate dull ache, swelling, bone deformity, bone fractures, curvature of leg bones. Rarely, fibrous dysplasia may be associated with a syndrome that affects the hormone-producing glands of your endocrine system. These abnormalities may include early puberty, overactive hormone production, and light brown spots on the skin. Increased bone pain also may be associated with the normal hormonal changes of the menstrual cycle or pregnancy. See your doctor if you or your child develops any of the following: bone pain that increases with weight-bearing activity or doesn’t go away with rest, bone pain that interrupts sleep, difficulty walking or limping, unexplained swelling, changes in bone shape and difference in limb length. Severe fibrous dysplasia can cause bone deformity or fracture. The weakened area of an affected bone can cause the bone to bend. These weakened bones also are more likely to fracture. Vision and hearing loss. The nerves to your eyes and ears may be surrounded by affected bone. Severe deformity of facial bones can lead to loss of vision and hearing, but it’s a rare complication. Arthritis. If leg and pelvic bones are deformed, arthritis may form in the joints of those bones. Cancer. Rarely, an affected area of bone can become cancerous. This rare complication usually only affects people who have had prior radiation therapy. The primary tool for diagnosis of fibrous dysplasia is an X-ray. While bone appears solid in an X-ray, a fibrous dysplasia lesion has a relative distinct appearance often described as ‘ground glass.’ The condition may be diagnosed, therefore, even in a person with no symptoms who is getting an X-ray for other reasons.